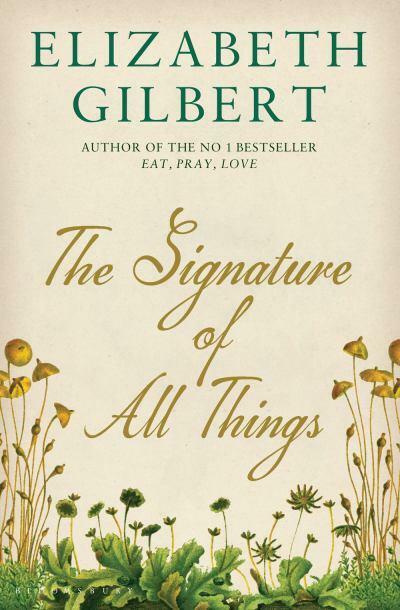 No great fan of Elizabeth Gilbert’s colossally popular memoir Eat, Pray, Love, I almost gave The Signature of All Things a pass. But I read a snippet of a review that described the new book as harking back to the novels of the nineteenth-century; perhaps it was worth a try? I genuinely enjoyed this historical novel (one of my favorite genres), which is essentially the life story of Alma Whittaker. Born in 1800 into great wealth and unusual privilege, Alma is a woman of remarkable intelligence, curiosity, persistence, and—so that she is not only formidable but also appealing as the central character—very human shortcomings. Much about Alma is exceptional: her ability to learn, her isolation on her family’s Philadelphia estate, her commitment to science as well as her impressive height and her lack of good looks. I couldn’t help picturing Alma as a nineteenth-century incarnation of Elizabeth I, from her red hair to her egotism: admirable and exasperating, yet also understandable and sometimes likable. In every way mosses could seem plain, dull, modest, even primitive. The simplest weed sprouting from the humblest city sidewalk appeared infinitely more sophisticated by comparison. But here is what few people understood, and what Alma came to learn: Moss is inconceivably strong. Moss eats stones; scarcely anything, in return, eats moss. Moss dines upon boulders, slowly and devastatingly, in a meal that lasts for centuries. . . . Under shelves of exposed limestone, moss colonies create dripping, living sponges that hold on tight and drink calciferous water straight from the stone. Over time, this mix of moss and mineral will itself turn into travertine marble. Within that hard, creamy-white marble surface, one will forever see veins of blue, green, and gray—the traces of antediluvian moss settlements. Although there wasn’t a real Alma Whittaker, Elizabeth Gilbert has convinced me that there might have been. Beyond entertainment, the tale of Alma’s long life also deftly delivers a moral: that if we are graced with long years, we should be doing something with them that’s integral to who we are and to who we still—even at sixty, seventy, eighty—aspire to become.